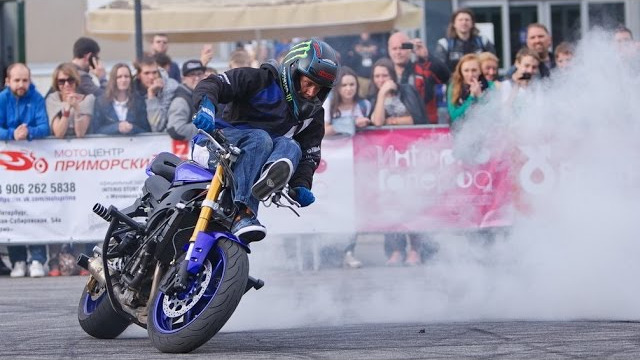 Stunter13 (Rafal Pasierbek) is one of the most famous pro-riders in the world. With his aggressive style, he made a revolution in sports, showing everyone that you can go fast, difficult, clean and with well connected combinations at the same time. Everything before Stunter13 is called old school now, and is practiced only on the amateur level. Rafal came to St. Petersburg with his show and as a judge at the largest national stunt riding tournament Inerio Stunt Cup. 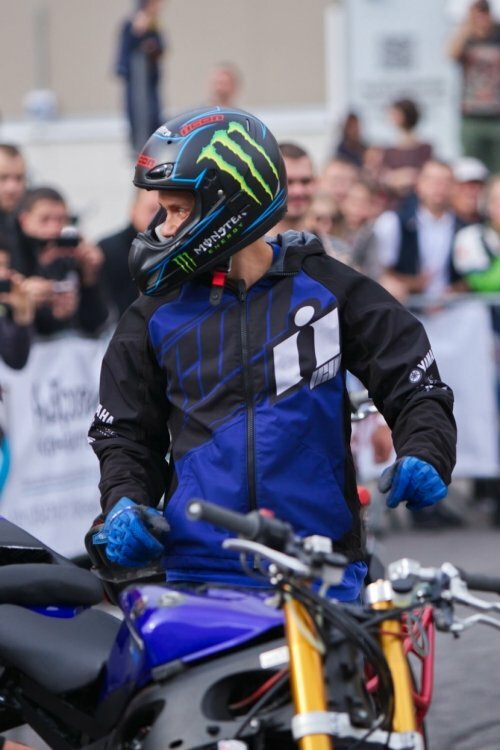 After victories at major European tournaments and in the American XDL, Rafal signed a sponsorship deal with Yamaha Motors and is now performing with his show around the world. He did not take part in the competitions for the last two years, but he may return to professional sports as early as next year if the American XDL series takes place, where he will be required to perform under the contract with Monster Energy. We could not get an interview because of the noise at the site and because he was busy, but we could talk at the after-party. Rafal gives the impression of an intelligent, friendly guy with good English: he answered all the questions openly and in detail. Yamaha Motors offered Rafal a new R6, but he chose the R6s. He told us that it took him long to get used to the bike and he had to set it up for a long time - that's how big its difference with the ZX636 is. Under the contract with Yamaha, he could not put a steel frame, which did not allow him to twist the handlebar and severely limited him in the drift. The solution was a fork from R1 with a large spread of feathers. A longer first gear allowed to mount a big sprocket to equalize the thrust. The relatively short base has advantages and disadvantages, but on the whole he is pleased with the motorcycle. The most difficult stunt in his entire career, according to his own words, was switchback drift, because he wasn't even sure that was possible - no one had done this stunt before him. It took him a year to master it. Everything else was easy for him. Rafal did not have serious injuries - this is largely the result of systematic training his good overall physical condition. He places great emphasis on stretching, joint flexibility and muscle elasticity, as well as acrobatics and endurance. In sports, Rafal values most the flow of the performance, so that the stunts just follow one another non-stop. He himself tries to promote such a style and believes that a prepared program is much more spectacular and complex than freestyle. We thank Rafal for a great show and the talk! We wish him good luck next year and hope to see him again in Russia!